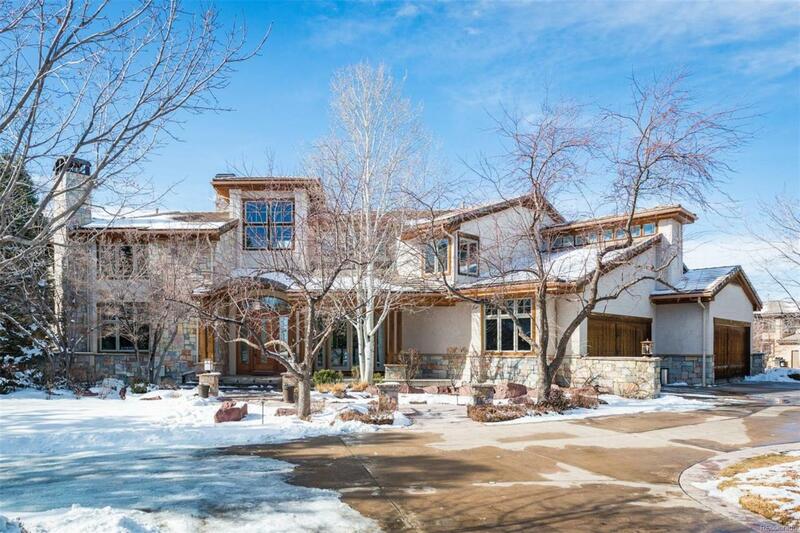 Exceptional Custom Home - Main Floor Master BR Suite - Quiet Cul-de-Sac - Backs to Trails & Open Space - Exquisite Mountain Views! Mature landscaping embraces patio, pool, spa, cascading waterfall & firepit; windows wrap perimeter, pulling fabulous light into every room; & deck with BarBQ provides coveted indoor-outdoor lifestyle connection. Barrel-ceiling entry adds subtle opulence into the home's grand spaces. Expansive kitchen, with island seating & alcove dining, offers wine & coffee bars, pantry, professional SS appliances. French doors enter sitting room of Main Floor Master BR Suite & amazing MBR with fireplace & walls of windows. Study has built-in cabinets, fireplace, mini bar & private stairs to Lower Level rooms for exercise, games, theater, bar, crafts, bedroom & storage. Easy flow with dual staircases & access to pool & outdoor extras are just steps away! 2nd floor showcases 4 en suite BRs, laundry & loft. All in, the space, ambiance, location & views are rarely matched!